Our universe is expanding. We’ve known this for nearly a century, and modern observations continue to support this. Not only is our universe expanding, it is doing so at an ever increasing rate. But the question remains as to what drives this cosmic expansion. The most popular answer is what we call dark energy. But do we need dark energy to account for an expanding universe? Perhaps not. The idea of dark energy comes from a property of general relativity known as the cosmological constant. The basic idea of general relativity is that the presence of matter warps spacetime. As a result, light and matter are deflected from simple straight paths in a way that resembles a gravitational force. The simplest mathematical model in relativity just describes this connection between matter and curvature, but it turns out that the equations also allow for an extra parameter, the cosmological constant, that can give space an overall rate of expansion. The cosmological constant perfectly describes the observed properties of dark energy, and it arises naturally in general relativity, so it’s a reasonable model to adopt. In classical relativity, the presence of a cosmological constant simply means that cosmic expansion is just a property of spacetime. But our universe is also governed by the quantum theory, and the quantum world doesn’t play well with the cosmological constant. One solution to this issue is that quantum vacuum energy might be driving cosmic expansion, but in quantum theory vacuum fluctuations would probably make the cosmological constant far larger than what we observe, so it isn’t a very satisfactory answer. Despite the unexplainable weirdness of dark energy, it matches observations so well that it has become part of the concordance model for cosmology, also known as the ΛCDM model. 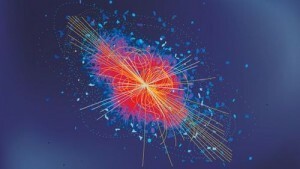 Here the Λ is the symbol for dark energy, and CDM stands for Cold Dark Matter. In this model there is a simple way to describe the overall shape of the cosmos, known as the Friedmann–Lemaître–Robertson–Walker (FLRW) metric. The only catch is that this assumes matter is distributed evenly throughout the universe. In the real universe matter is clumped together into clusters of galaxies, so the FLRW metric is only an approximation to the real shape of the universe. Since dark energy makes up about 70% of the mass/energy of the universe, the FLRW metric is generally thought to be a good approximation. But what if it isn’t? A new paper argues just that. Since matter clumps together, space would be more highly curved in those regions. In the large voids between the clusters of galaxies, there would be less space curvature. 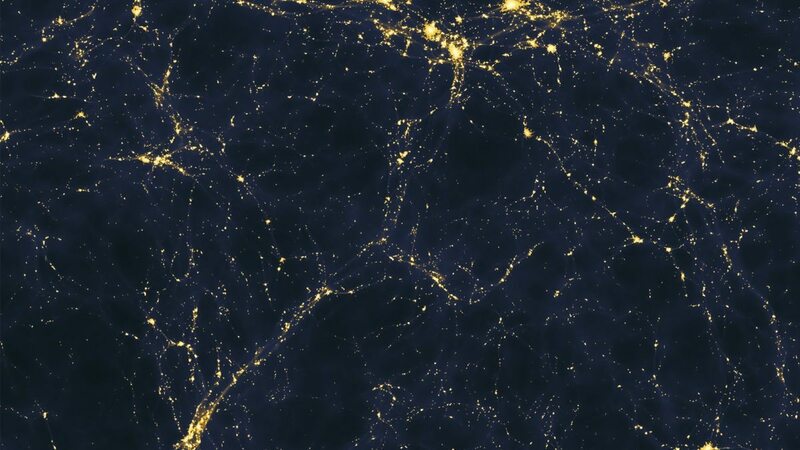 Relative to the clustered regions, the voids would appear to be expanding similar to the appearance of dark energy. Using this idea the team ran computer simulations of a universe using this cluster effect rather than dark energy. They found that the overall structure evolved similar to dark energy models. That would seem to support the idea that dark energy might be an effect of clustered galaxies. It’s an interesting idea, but there are reasons to be skeptical. While such clustering can have some effect on cosmic expansion, it wouldn’t be nearly as strong as we observe. While this particular model seems to explain the scale at which the clustering of galaxies occur, it doesn’t explain other effects, such as observations of distant supernovae which strongly support dark energy. Personally, I don’t find this new model very convincing, but I think ideas like this are certainly worth exploring. If the model can be further refined, it could be worth another look. Saw information on this paper and was hoping you would write about it. Very interesting, though as you say not overwhelmingly convincing. There’s a qualitative model of the force of gravity, that is geometric and can include a cosmological constant, without the complications of special relativity. In this model, masses don’t move at all, rather the space between two masses shrinks with time, and the space far away from all masses expands with time. If the rates of expansion and contraction are balanced just right, the total amount of space remains the same. Otherwise, depending on the exact balance, either the universe will converge to a single point, or the large expanses of empty space will expand forever. And this expansion is accelerating similarly to what we see from distance supernovas: the size of voids will grow exponentially with time. Special relativity isn’t a complication. It’s how the universe works. But having special relativity adds a dimension to the geometry, and one must imagine coordinate lines of time curving into space-like surfaces in order to understand attraction. Whereas any geometric model of gravity, even one that doesn’t give correct results or reflects reality, still contains a principle of equivalence, and may contain a cosmological constant. It looks like they developed their own software and made it available https://github.com/eltevo/avera. Does the Astonomy/Cosmology community have open source software projects that provide libraries that one can import into their own software and not rewrite the same function(s)?